Don’t Count on HR to drive the change! Whenever the human side is involved, organizational change projects tend either to ignore it or to completely outsource it to the human resources (HR) department. 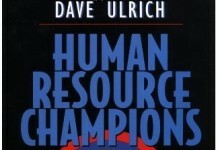 But HR is not an agent of change.